Home > Spinal Conditions > What is Ankylosing Spondylitis? Ankylosing spondylitis is a very painful and debilitating condition.Affecting men more than women it causes high levels of inflammation of the spinal vertebrae and sacro-iliac joints (where the bottom of the spine meets the buttocks).The complaint can affect any age, even children and is diagnosed by a thorough physical examination, blood tests and X-ray imaging, all which will be arranged by your GP. The main symptoms of this condition are stiffness, pain and a reduction in mobility.All of these symptoms are usually worse in the morning or after long periods of inactivity.Occasionally there may be the occurrence of a forward curvature of the spine due to the inflammation, pain and bad posture from adopting a pain relieving position. Ankylosing spondylitis can actually spread to other parts of the anatomy, causing further pain and distress and inducing high levels of fatigue and sometimes depression in sufferers. Sufferers normally have some type of arthritis in other joints of the body. Pain gradually worsens over time with few sufferers experiencing a sudden onset. 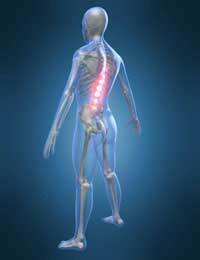 If left untreated or when in advanced stages, ankylosing spondylitis can lead to the individual vertebrae becoming so inflamed that they can actually fuse together. These fusions are normally quite brittle and therefore more prone to fracture. They also may cause the associate ligaments to weaken leading to a higher risk of damaging the spinal column and the spinal cord. Advanced spondylitis can lead to problems with the kidneys so your GP may wish to monitor their function by taking regular urine samples.It is thought to be caused by a genetic link, so the families of sufferers should be aware that by keeping fit and healthy, they will decrease the chance of developing severe symptoms if diagnosed. Many sufferers find that a warm bath or shower can help alleviate the pain and stiffness associated with this condition, as can massage therapy, but do make sure the therapist is trained and knowledgeable about the condition.Exercise is a good way of keeping mobile and supple. Swimming is particularly good as individuals can choose their own pace, and movement may be easier in the water. Activities that increase stress and pressure on the back and joints should be avoided such as running as this can aggravate the pain and inflammation. Walking is more gentle and will not cause the joints to knock together or ‘jar’.The use of anti-inflammatory medication is widely used, especially when an episode of higher pain is occurring. If these fail to work effectively, drugs that lower the body’s natural immune system may be prescribed to help reduce the inflammation of not only the spinal joints, but others around the body that may be affected. Steroid injections may be useful for some people, though they carry many side-effects that are unpleasant and even dangerous. Physiotherapy is recommended as the posture may need improving, which will also allow for greater lung expansion and deeper breathing. Smoking should be avoided as this will reduce lung function and the oxygen levels in the blood.Braces or support belts may be useful in supporting the spinal column on movement and will help the individual carry on with employment or even with the activities of normal daily living. Surgery is not often recommended and is usually only indicated in the presence of nerve damage.Ankylosing spondylitis is a very serious condition and each individual will experience it differently and should develop their own treatment plan and coping strategies.